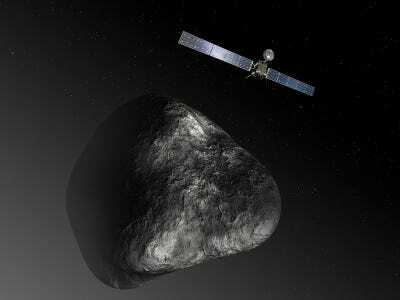 European Space AgencyArtist’s impression of the Rosetta orbiter at comet 67P/Churyumov — Gerasimenko. On Wednesday, the people of earth landed the very first space probe on a comet. This is the first step towards all sorts of plans we have for comets, such as one day mining them for minerals and water. The particular people involved were from the European Space Agency. The probe is known as the Philae lander and we gave the comet the lovely name 67P/Churyumov-Gerasimenko. It turns out, the comet speaks, or sings, as the scientists discovered. That’s probably a generous term for it. Human ears can’t actually hear its noises. But the RPC was able to capture these sounds and, with the help of German composer Manuel Senfft, they became a song, uploaded to Soundcloud for all to hear.